VFD Comes with a feature of controlling the frequency of VFD by connecting a POT to it. Well its a very general practice which almost all the VFD users are using to RUN the drive manually. Well the best advantage of POT is that we can connect it to VFD and place it at the user interface panel and even the Lay-Man can even operate it very easily. You have just turn the Knob of POT to increase or decrease the speed of Motor. You can review the VFD Basics in our earlier post about VFD Basics. Every Drive has got three terminals for connection of POT to it. But before connecting the POT to yours VFD check the rating of POT from the Drives manual , but most of the VFD accepts the POT of rating 1-2 K ohm , So select the POT accordingly . Now if you will see the VFD then there will be three terminals for POT connection and one terminal for Current input (4to20mA) signal. We will see in the later post about the connection of Current Signal to VFD . We will take here the example of Omron 3G3JX drive series. Omron JX drive has got POT terminals as FS FV FC . FS -->> Frequency reference power supply. 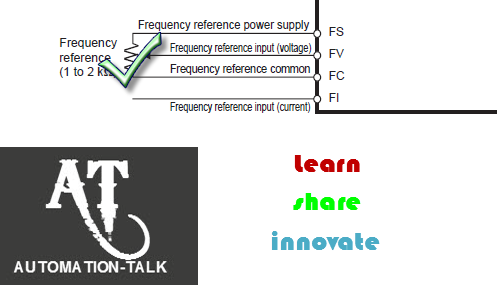 FV -->> Frequency reference input (voltage). 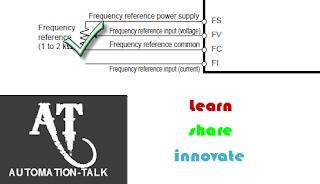 FC --> Frequency reference common . If you will see at the POT then there will be three wire coming out of it , two for supply voltage and for frequency reference. So connect the supply wire at FV , common at FC and and frequency reference at FV terminal respectively. It is always recommended to use shielded cable for connection of POT. See the below picture for a better understanding. Almost all the VFD have the same connection only the nomenclature of the POT terminals changes. The above told connections are also valid for OMRON 3G3MX and 3G3RX drive series. ------------------------------------------------------------------------ 01 to start from 0 Hz. A016 ----------------FV sampling ----------------------------------------set from 1 to 17. Note : - You need to set A016 parameter only when there is noise so set a larger data value if stable operation cannot be secured because of noise. But remember the larger the value slower will be the response. So after setting up all these parameters in Drive recycle the power and start the VFD and after giving RUN command just turn the knob of POT and you will see that frequency will increase and decrease. If you are using other then OMRON drive then also read the manual and search for related parameter and set them accordingly . 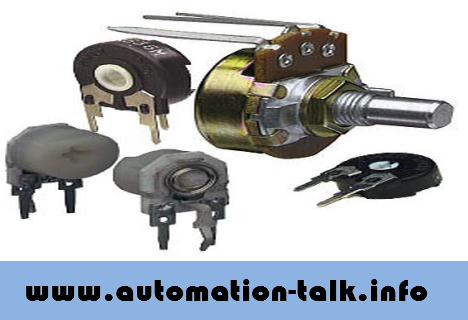 There are almost same parameter with even same name in Allen Bradley , Siemens , Mit-subishi , Baldor Drive with just parameter number change. If you like to have read more post like this then you can subscribe to Automation Talk to receive the updates regarding PLC Programming , VFD , SCADA and HMI in yours Inbox. If you are facing any problem with connection of POT then leave a comment and we will get back to you ASAP.